Amy O’Connell congratulates the grand prize winner of the iPad, Walter Ullendorf. SILVER CREEK — The Friends of Anderson-Lee Library held their annual Christmas in July Raffle drawing July 26. 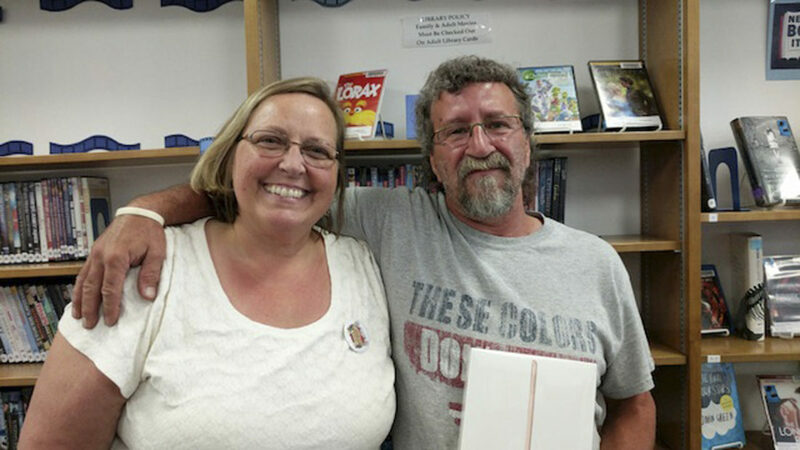 President of Friends, Amy O’Connell, congratulates the grand prize winner of the iPad, Walter Ullendorf. iPad donated by Friends of Anderson-Lee Library: Walter Ullendorf; Southern Comfort Fiery Pepper Whiskey donated by Barone’s: Ken Arnold; Cranberry Concord Wine, donated by Barone’s: Sandi Gawlak; Free Wine Tasting and Tour for 6, donated by Liberty Vineyard: Linda Beach; 2 Fish Fry Dinners, donated by Silver Creek VFW: Amber Lockwood; 2 Fish Fry Dinners, donated by Silver Creek VFW: Kay Naudasher; $20 gift certificate donated by Food King: Ashley Bennett; $20 Gift Certificate donated by Food King: Andrea Piedmont; $15 Gift Card donated by Just Pets: Bill Wright; $25 Gift Card donated by Stagecoach West: Lou and Theresa Dispenza; $20 gift card donated by Woodbury Winery: Diane Petrucci; $20 gift card donated by Woodbury Winery: Phyliss Burghardt; $20 gift card donated by Woodbury Winery: Mark Sackett; $20 gift certificate donated by Little Guys: Katherine Brinkman; Sunglasses donated by Silver Creek Optical: Steve Jimerson; $20 gift certificate donated by Frost Treat: Ann Allaire; $25 gift card donated by Ellie’s Deli: Nancy Vaughn; $25 gift card donated by Aunt Millie’s: Eileen Ulrich; bird feeder and seed, donated by Wild Birds Unlimited: Karen Mourer; $10 gift card donated by Valvo’s Candy: Amber Lockwood; $10 gift card donated by Valvo’s Candy: Paulette Strzempka; $50 gift certificate donated by Shevlin’s: Emily Wright; $25 gift certificate donated by Willow Creek Winery: Cathy Clark; Mary Kay basket donated by Lana Holdridge: D. Stroud; electric pressure cooker donated by Pompender’s: Bridget Wright; Deluxe Pedicure Foot Bath donated by a Friend: Dail Mizerski; children’s towel and soap set donated by Grape Country Soaps: Gloria Olmsted; gift card donated by Jim White’s Auto: Josie Crino; $10 gift certificate donated by Tom’s Family Restaurant: Debbie Ormsby; $10 gift certificate donated by Tom’s Family Restaurant: Rick Hotelling; Travel steamer donated by a Friend: Margaret Chambers; Box of handcrafted stationary donated by Paulette Strzempka: Sandra Rice; $30 gift card donated by Sullivan’s: E. Matterson; Candle warmer and tarts donated by Grape Country Candles: Diane Petrucci; Christmas candle basket donated by Grape Country Candles: Jim and Cindy Klocko; Wine and chocolate basket donated by Merritt Winery: Gail Kennedy; Small end table, handcrafted and donated by Bob Sutehall: Mary Jo Schreiber; Wren house, handcrafted and donated by Bob Sutehall: Linda Forti; Blue bird house, handcrafted and donated by Bob Sutehall: Nichole Farner; Yoga mat and 5 class punch card donated by Yoga Underground: Marcia Erdle; $10 gift card donated by Tim Horton’s: Faith Heister; $10 gift card donated by Tim Horton’s: Marie S.; Hair care products donated by A Cut Above: Barb Reuger; $20 gift card donated by Top’s: Amber Bell; Christmas themed gift basket donated by a friend: Gail Kennedy; Tool box and home supplies donated by a friend: Jim White’s Auto Center; Lighthouse themed gift basket donated by a friend: Paulette Strzempka; $20 gift certificate donated by Hamlet’s: Andrea Piedmont. Money collected from the raffle will provide many programs for all ages to be offered at the library on Main Street in Silver Creek. These programs are listed on the Anderson-Lee Library Facebook page, in the OBSERVER, and at the library. The Friends of Anderson-Lee Library extend an invitation to area citizens to come in and take advantage of what the library has to offer.